Of all the main areas of the web, analytics is one of the most misunderstood. Among the most frequently cited misperceptions are the ideas that it’s a difficult and highly technical field in terms of both set-up and everyday use, that it incurs high costs but delivers few benefits, that it’s a field reserved for experts, since it requires an advanced skill level to be able to use it… All this contributes to people’s perception of the field as a burden rather than an opportunity. However, the importance of data in decision-making models is exploding in a nearly exponential way. At the same time, analytics is currently experiencing unprecedented democratization and popularization, mainly thanks to the countless blogs on the Internet today. Analytics is an opportunity, both for your business to grow, and for you to stand out in the eyes of your director. Why deprive yourself or your business of the opportunity? So, here are four reasons why you should step up and make an investment in analytics for your organization. Measurement of ecommerce activities: How much revenue have you generated? What’s your best seller? How often do users add products to their cart? At what point in the conversion funnel do they drop off? Analysis of your advertising ROI: How much have you earned for every dollar spent on ads, online and off? Are your ads a first point of contact with consumers, or are they closing the sale? With the right analysis, this data can be used to optimize your budgets and your operations to make you more efficient. All that for the modest amount of $0. This field, while definitely technical when you get to more advanced practices, is far more accessible than people realize. No high-level expertise required – all you need to know are a few basics and you’ll be able to reap major benefits. Implementing an analytics system is more than just embedding code on your site. The main part of the work is done before that, when you’re defining your objectives, tactics, KPIs, and metrics. 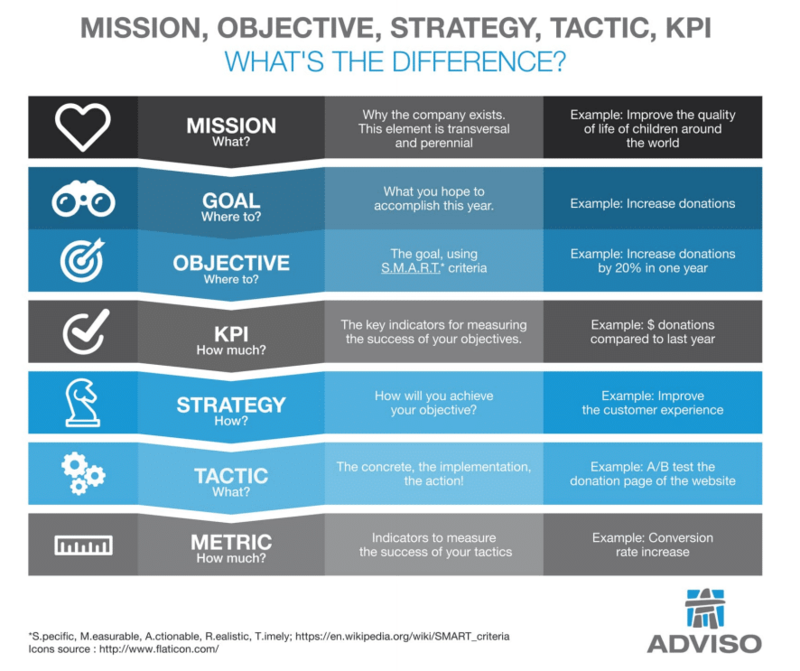 My colleague Anne-Sophie Guillou published an excellent article on this, to help you define and differentiate your mission, objectives, tactics, and strategies. This critical process will allow you to define your company’s high-level objectives with precision, and how to reach them. Finally, analytics allow you to create opportunities both for your business and internally, because it gives you the chance to take a step back and gain perspective on your organization. Analytics should be implemented only after you’ve done some in-depth thinking about your company, its goals, and the purpose it serves. This process should also be revisited regularly as your company evolves. This way, the exercise of updating your analytics system can contribute to the organization’s overall strategic thinking: Over and above feeding data into it, this is the time to integrate this step into your strategic planning. With these arguments, you should be well equipped to spread the benefits of analytics throughout your company – not just the IT department! The more mastery you gain over the tool, the more you’ll be able to use the full power of your data to participate in the strategic growth of your company! Yann is a major asset for any digital project. His work consists of analyzing client needs and offering solutions to measure and reach their interactive marketing objectives, while also detecting and recommending solutions to their conversion challenges.